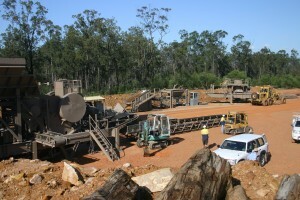 Having made a significant investment in a brownfield quarry and crushing plant on the outskirts of Toowoomba, Earth Commodities faced a number of challenges before realising their first tonne of processed product. Time and money were of the essence. The purchased plant was mechanically sound but the electrics needed to be replaced in their entirety in terms of conditioning as well as conforming to standard. Compounding this, was no mains power on site and a 26 week lead time from Energex to obtain a connection.